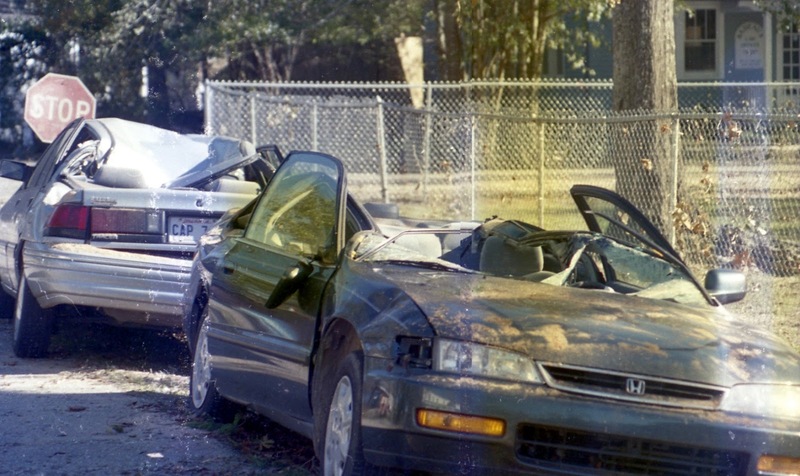 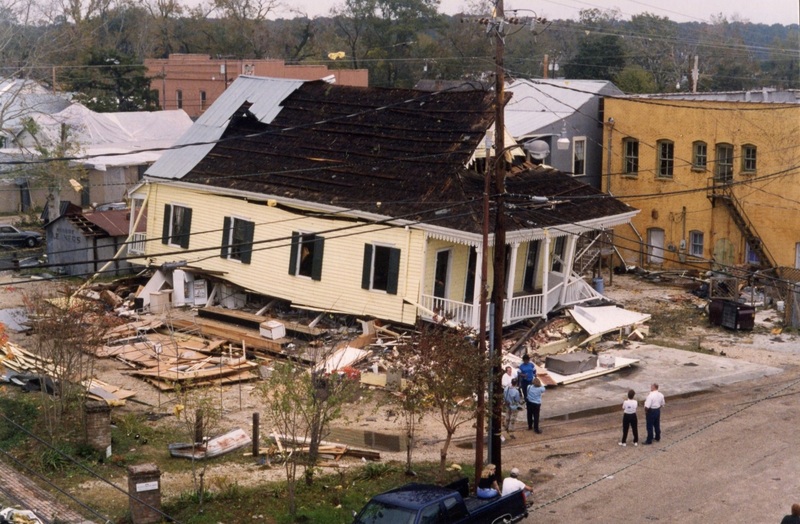 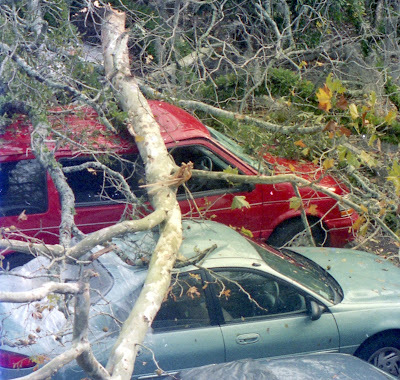 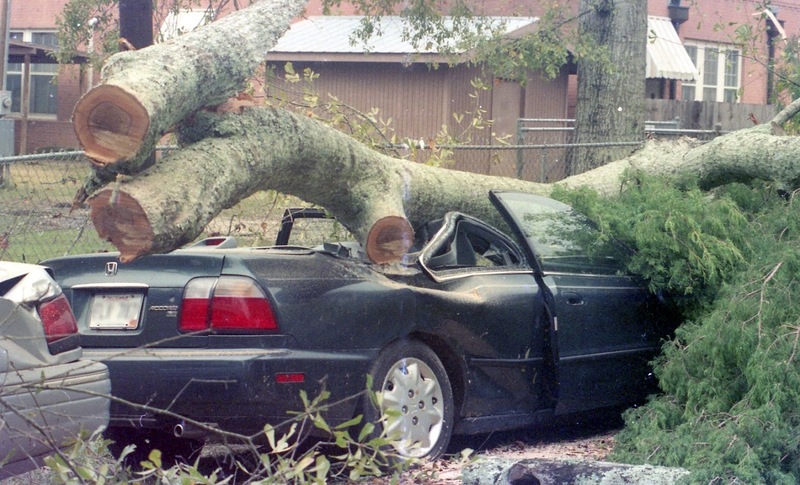 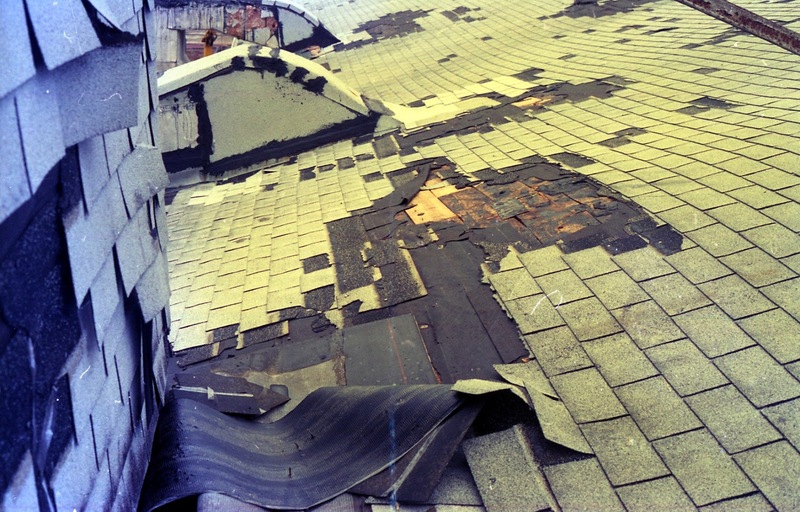 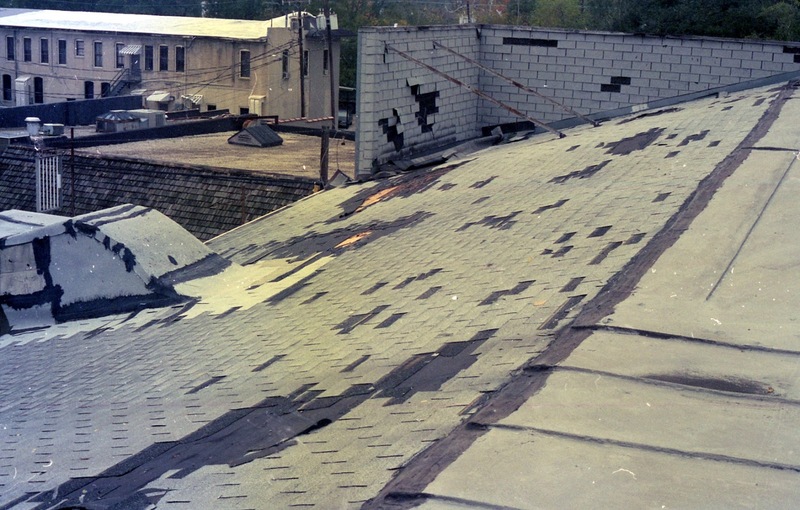 In November of 1997 a tornado blew through Covington, destroying several buildings, damaging dozens of homes, smashing a number of cars and generally wreaking havoc in the downtown area and along its path from the southwest to the northeast. Here's a picture of Hebert's Cleaners on Gibson Street, taken from the roof of the Star Theater. When a two story building becomes a one story building. 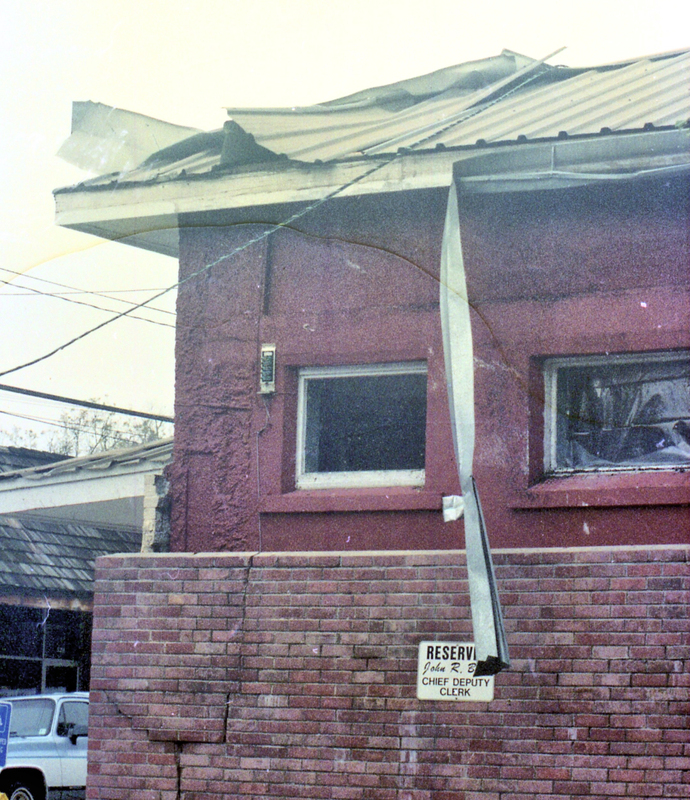 Hebert's was one of the less fortunate buildings, with the second floor collapsing on top of the first. 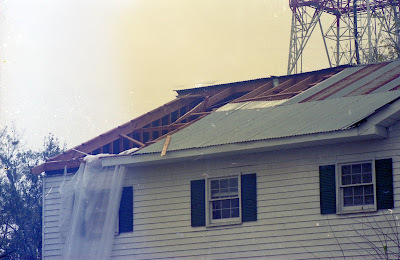 It was reported that the people inside on the first floor were saved from being crushed by the second floor when a refrigerator held up the second story, giving them enough space to escape. 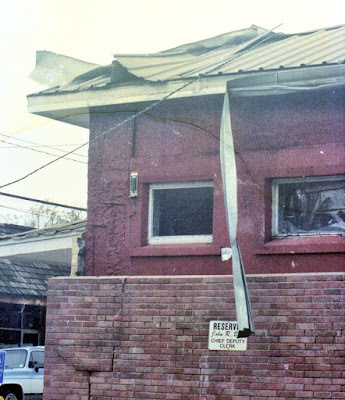 You can see that refrigerator in the photograph above towards the rear of the building.Click on the images to go to a larger version. 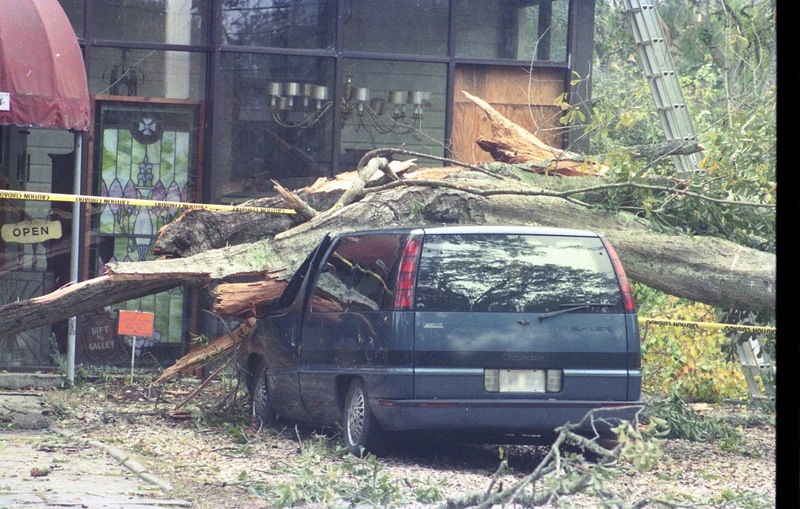 Here are more details on the tornado itself, which took place on November 21, 1997. According to the website http://www.usa.com/covington-la-natural-disasters-extremes.htm, a severe thunderstorm produced a tornado as it moved into St. Tammany Parish. 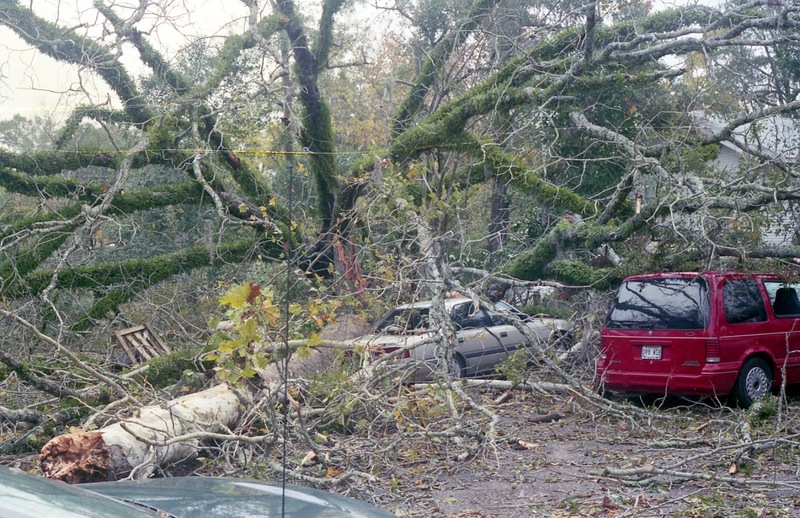 The tornado was first observed by the State Police on Interstate Highway 12 west of Covington. "From data collected on a ground, damage survey by the National Weather Service, the tornado moved on a path slightly north of due east. The tornado moved across the downtown area of Covington and continued east for nearly two miles before lifting off the ground. Most of the damage along path indicated F1 damage, however, several areas near downtown Covington were classified as F2 damage. 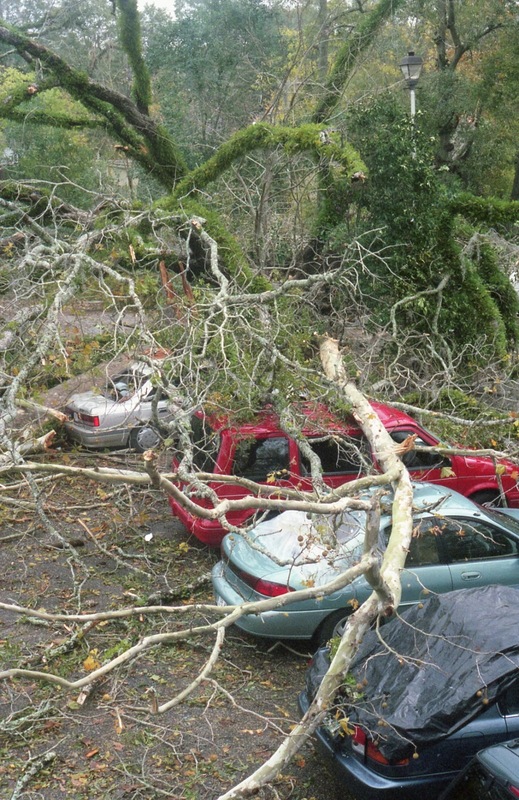 Parish officials reported 43 injuries were reported with tornado, though most were relatively minor. " Six persons required an overnight stay in a hospital, including three pregnant women. 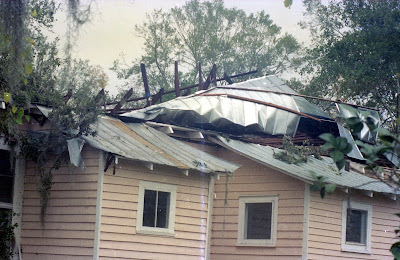 Most of the damage to homes was due to large pine trees which had been toppled onto houses. In downtown Covington, a few large buildings lost roofs, had windows blown out, or suffered substantial damage. 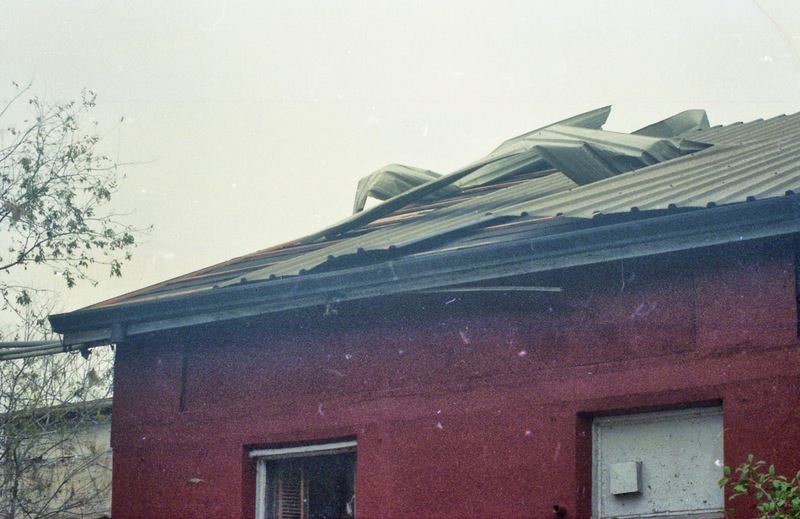 A large parish building suffered $500,000 damage. 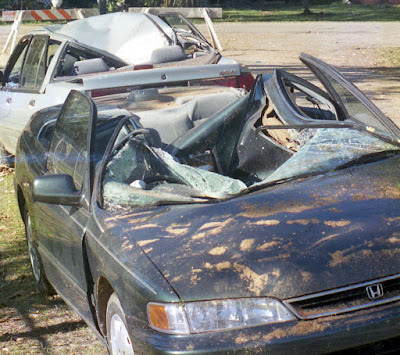 Media reports indicated cleanup would cost several million dollars. American Red Cross reports indicated 69 single family homes were destroyed or had major damage in St. Tammany Parish. 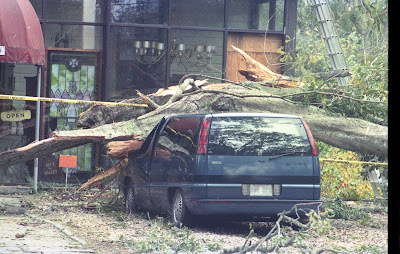 Four public buildings were also heavily damaged, the report stated. 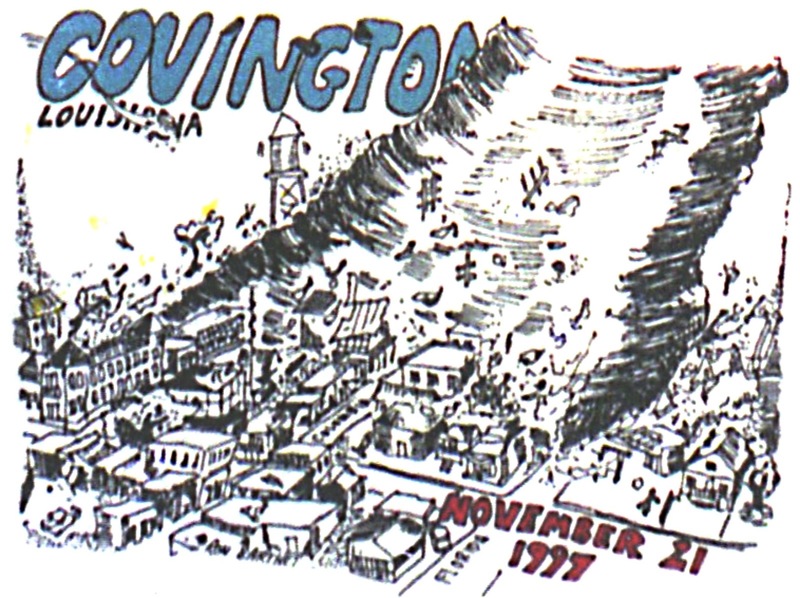 A T-shirt depicting the Nov. 21, 1997, Covington tornado was produced by Artmasters Inc. screen printers and was distributed by the "Have a Heart Through Art" Foundation to help raise money for the storm victims. 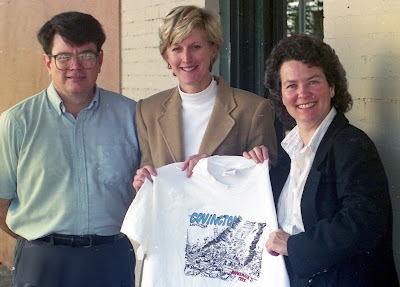 From left are Ron Barthet, artist; Denise Gutnisky, foundation head; and Susan White of Artmasters. 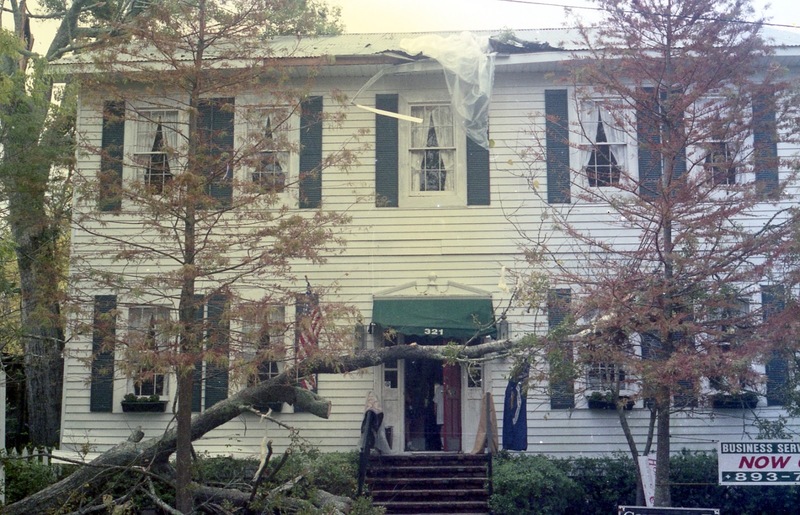 The shirts were sold at the Columbia Street Tap Room, Natural Foods Market, and Courthouse Square Business Service Center. 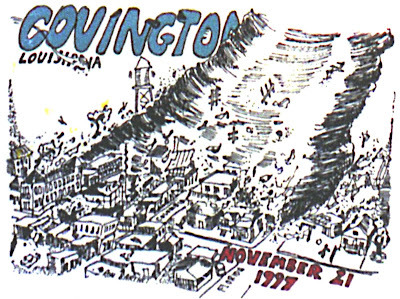 The Covington Food Bank screened recipients of the storm aid raised by the T-shirt sales. 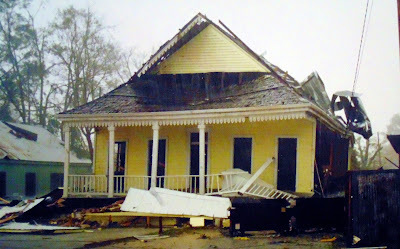 The above photo was published on December 4, 1997, in the St. Tammany Farmer newspaper.